NAMM 2011 PRESS RELEASE: Dean Guitars and the John Entwistle estate will be unveiling two models of the new John Entwistle bass line at the 2011 Winter Namm show in Anaheim, California, 13 - 16 January. According to John's son Chris Entwistle, the estate chose Dean because of their attention to detail plus their willingness and ability to bring the project to market swiftly without sacrificing quality. Steve Luongo, John's drummer and personal friend of 15 years, steered the estate to Dean Guitars as he knew company CEO Elliott 'Dean' Rubinson is a touring bass player who grew up on John's playing. "Brand was not as important to John as the actual playability and John would let the instrument do the talking," said Luongo. "John has been a huge influence on me and I am proud to be on the front line in the development of these instruments, also being able to play and hear them live on stage when playing with the Michael Schenker Group and Cactus," Rubinson said. 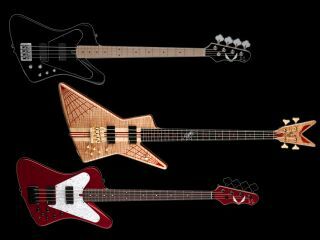 The first two models in the new Entwistle line are 'The Spider' and 'The Hybrid,' both made in Dean's legendary USA Custom Woodshop in Tampa, FL. Both of these USA models will incorporate the new Aphex Exciter/Big Bottom/Compression circuit on board, an industry first. There is also a Hybrid model that sells for under $1,000. "I know that if John were here today he would love these basses," said company CEO Rubinson, who will join Steve Luongo and Mark Hitt on stage at the Dean Guitars 2nd Annual NAMM JAM party, Fri. 14 Jan at The Grove of Anaheim, where the bass will be played in public for the first time.